William Rowland, one of Sherborne’s iron founders, whose name can still be seen on gratings around the town, featured in one of Graham Bendell’s talks at our Industrial Archaeology Day on 22 November. William Rowland was born in Bristol about 1840. By 1851 his family had moved to Salisbury where his father was in business as an engineer and iron founder employing three men. William was working for his father in 1861 as an engineer. 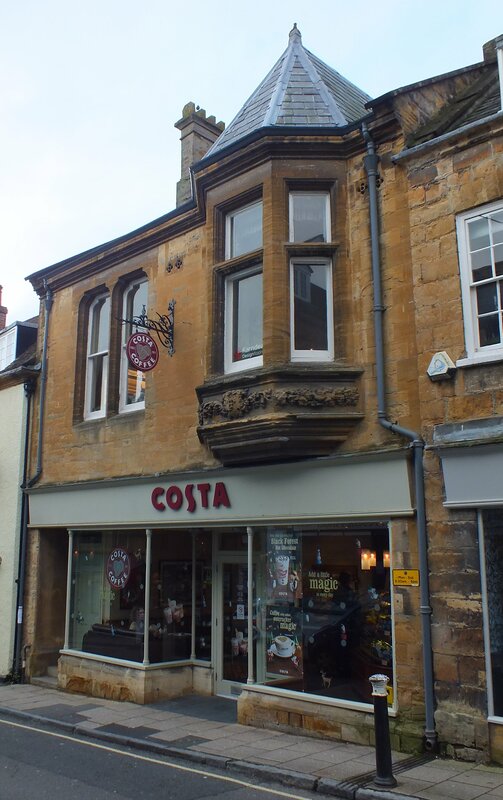 An advertisement in The Western Gazette, dated 11th October 1867, announced that William Rowland had taken the premises in Cheap Street, Sherborne, formerly occupied by William Read, who had been in business as an iron founder from about 1860 until it failed in early 1867. The advertisement went on to give the scope of Rowland’s operation, namely “Engineer, Millwright, Iron and Brass Founder and Agricultural Machinist”. The following week the paper reported that Rowland had a stand at the town’s Pack Monday Fair where he exhibited, amongst other things, a chaff cutter and an “improved meat chopper”. In 1868 Rowland tendered for the supply and erection of the waterwheel and pumps at Castleton. Clearly, he had a high degree of confidence, his bid being third on price. The cheapest tender was rejected and the contract eventually awarded to the established firm of Stothert & Pitt of Bath. Rowland continued to advertise regularly both for staff and to announce his products and services. He acted as an agent for several companies and advertised “The Canadian Washing Machine”. 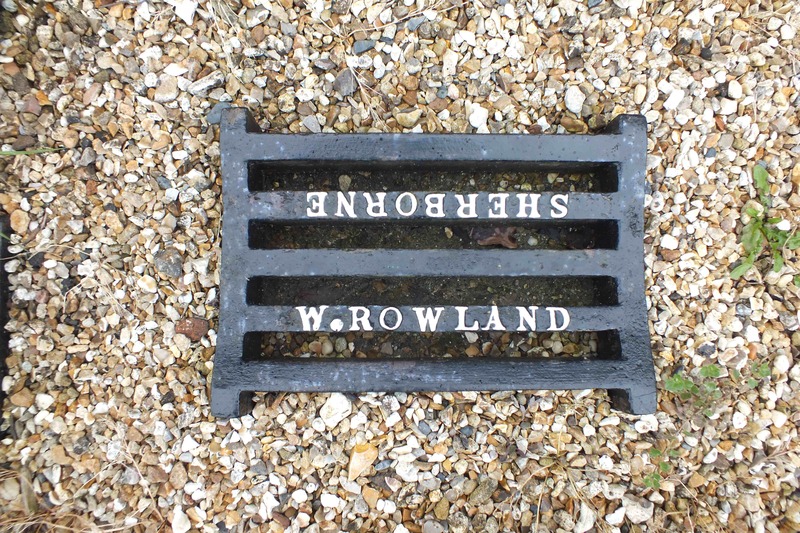 Evidence of Rowland’s foundry can be found in gully gratings around the town. These are diminishing in number, but one can be seen in Hound Street at the junction with Fosters and two more in George Street. 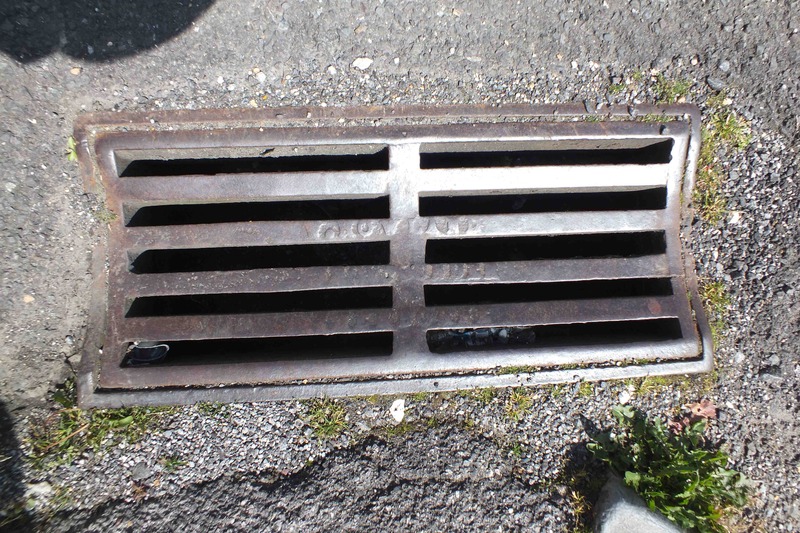 A well worn Rowland grating in George Street (not in bad condition considering it is at least 128 years old). There is another example in situ, which can be seen on open days at the Sherborne Steam and Water Wheel Museum at Castleton. They are becoming very worn but careful inspection reveals their maker. A smaller Rowland grating in the collection at the Sherborne Steam and Water Wheel Centre. I know of no examples of machinery manufactured by Rowland and would very much like to hear from anyone who has, or knows of, such an item, or indeed who knows of any iron object made in Sherborne. Rowland’s foundry was behind the premises now occupied by Costa Coffee while he and his family lived on the opposite side of Cheap Street, next door to Daniel Parsons’ butchers’ shop (1871 census). By 1881 they had moved to Green Hill. Rowland’s business failed in 1886 and he was declared bankrupt. A sale of his equipment was advertised in The Abbot of Sherborne newspaper of 25th November 1886. He was discharged from bankruptcy in 1887 and by 1891 was living in Salisbury and was in business as an engineer. His departure from Sherborne marked the end of iron founders in the town, as far as can be established at this point but Rowland continued in business in Salisbury until his death in 1902. This entry was posted in Uncategorized and tagged Castleton, Cheap St, Dorset, Family History, George St, Graham Bendell, grating, Hound St, iron foundry, Pack Monday Fair, SDFHS, Sherborne, Sherborne Steam and Water Wheel Museum, William Rowland. Bookmark the permalink. 3 Responses to William Rowland – iron founder of Sherborne. Many thanks Tim – Graham will be very interested to hear that. Lots of thanks, Graham, for your very interesting report of your talk about William Rowland. Hence, the poor oversea members feel much more involved in the life of the Society.